Background and Objectives: Among various interarch appliances for the correction of Class II malocclusion, PowerScope is one of the latest appliances used in the clinical practice of orthodontics. This clinical study was conducted to evaluate the clinical efficiency of PowerScope appliance by assessing skeletal, dentoalveolar, and soft-tissue changes and condyle-glenoid fossa relationship after using the appliance. The null hypothesis of this research is that there is a significant difference between dentoalveolar and soft-tissue changes alone. Methodology: Ten patients of age between 11 and 16 years, 4 males and 6 females, who reported to the Department of Orthodontics and Dentofacial Orthopedics, have been treated for Class II malocclusion (nonextraction) were selected for the study. Inclusion criteria included convex profile, retrognathic/deficient mandible, growing patient at least pubertal growth period, minimal crowding, and positive visual treatment objective. Exclusion criteria included patients with neuromuscular disease, temporomandibular joint problem, and skeletal open bite. Statistical Analysis: Statistical analysis is performed using Wilcoxon signed-rank test. Results: The study revealed the following findings. There are statistically significant changes in dentoalveolar and soft-tissue parameters after using PowerScope appliance. Statistical significant changes are seen in the anterior and posterior joint spaces relationship after using PowerScope appliance. Interpretation and Conclusion: Thus, PowerScope was clinically efficient in the correction of Class II malocclusion in noncompliant patients. Although there were changes in the skeletal parameters, they are not statistically significant. Hence, based on this clinical study, we can conclude that the Class II correction with PowerScope occurred almost entirely by dentoalveolar movement. One of the success factors in orthodontic treatment is patient compliance. However, orthodontists cannot always rely on patient cooperation. Noncompliance has been a concern in orthodontics for more than 40 years, and a number of publications since then attest to continuing interest. Fixed functional appliances (FFAs) require minimal patient compliance and can be grouped into different categories based on their mode of action. Patients with Class II division 1 malocclusion can exhibit maxillary protrusion, mandibular retrusion, or both, together with abnormal dental relationship problems and facial esthetic disorders. These malocclusions are treated with various orthodontic and orthopedic approaches; functional appliances are commonly used to treat Class II division 1 malocclusions during the pubertal growth period. Removable FFA's such as (activator, Balters bionator, Twin block, Fränkel) and fixed FFA's such as (Herbst, Jasper jumper, mandibular anterior repositioning appliance Forsus Nitinol Flat Spring, Forsus FRD, PowerScope). The first-fixed (stationary) functional appliance was introduced by Emil Herbst in 1905. It is still popular today but has some disadvantages, such as limitation of lateral mandibular movements (inflexible) and obstruction of oral hygiene maintenance. Evolution of different FFAs over the years has led to the introduction of newer FFAs. A number of fixed appliances have gained popularity in recent years to help achieve better result in noncompliant patients. One of the such innovations is PowerScope, which is hybrid appliance for the correction of mild skeletal Class II in noncompliance patients. PowerScope [Figure 1] is the latest innovation in Class II correction. This appliance addresses critical needs of the orthodontist, including patient comfort and acceptance, extensive range of motion, and simple installation. Dr. Andy Hayes worked in conjunction with the American Orthodontics to develop PowerScope. PowerScope also has the advantage of permitting lateral movements due to exclusive ball and socket joints and typical telescopic mechanism is also advanced feature; unlike other Class II correctors, there is no need for assembly measuring or appliance manipulation. This wire-to-wire device delivers unmatched patient comfort and eliminates the need for headgear tubes or special band assemblies. For complete analyses of temporomandibular joint (TMJ), imaging examinations are required. Panoramic and conventional radiographs may identify rough TMJ changes, but these methods are restricted in diagnosis because of the anatomical superposition that prevents accurate view of the bone components. In this way, computed tomography (CT) is selected in the present study for precision in diagnosis and minor anatomical changes of TMJ. 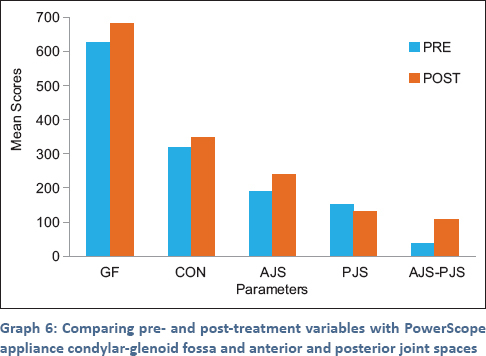 Therefore, the present study determines the condyle-glenoid fossa (CON-GF) relationship by using CT scans before and after the treatment with an FFA PowerScope. 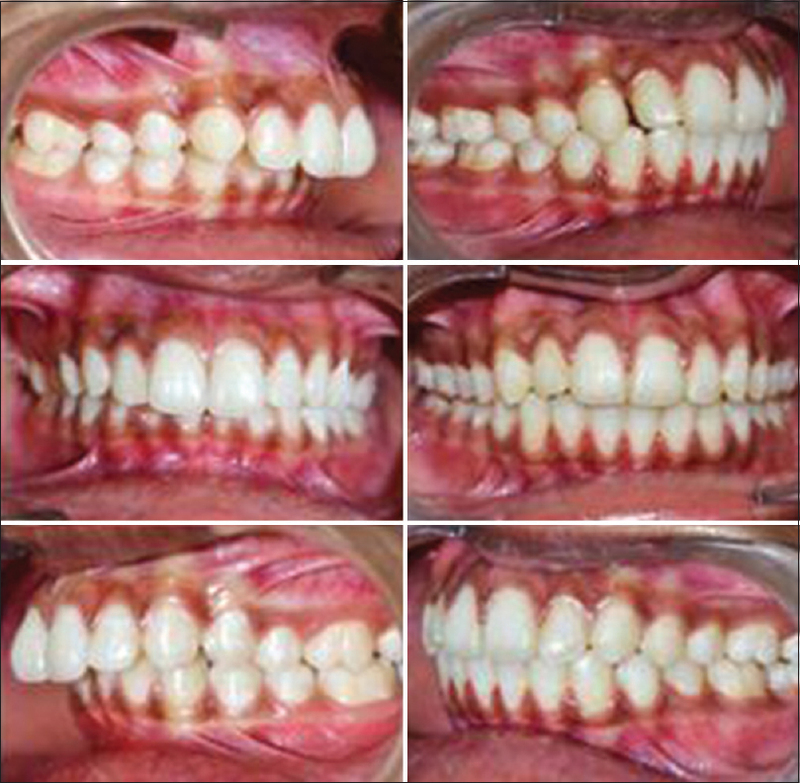 To evaluate the CON-GF relationship and skeletal changes before and after treatment with PowerScope appliance in treating Class II malocclusion. Age of the patient: 11–16 years mean age of 13.5 years with Peak pubertal growth period. 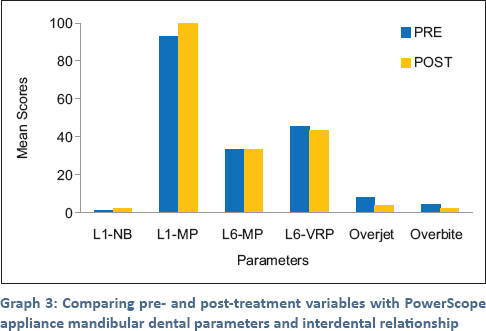 This study was conducted to determine the skeletal, dentoalveolar, soft-tissue, and CON-GF relationship changes after using PowerScope appliance in the treatment of Class II malocclusion with normal maxilla and deficient mandible (nonextraction) cases. Patients with skeletal open bite. All patients included in this study exhibited Class II skeletal and Class II dental malocclusion, deficient mandible, minimal crowding and were treated with MBT™ bracket prescription (0.022-inch slot) (Ortho organizers). Leveling and aligning was carried out with 0.014” NiTi, 0.016” NiTi, 0.017” × 0.025” NiTi, 0.019” × 0.025” NiTi, and finally, 0.019” × 0.025” stainless steel archwires. After the initial leveling and aligning, midstage lateral cephalograms and pretreatment CT [Figure 2] were made. The lateral cephalograms were taken in standardized natural head position. PowerScope was installed following manufacturer's installation guide. Selected patients with inclusion criteria will be subjected to lateral cephalogram imaging before the initiation of treatment. After initial leveling and aligning procedure, just before delivery of PowerScope, patients' CT image of TMJ shall be taken. Followed by delivery of appliance according to manufacturer's instructions, appliance [Figure 3] will be maintained until an unstrained Class I canine and Class I molar relation is obtained. Followed by the removal of the FFA, a second CT image of TMJ [Figure 4] and a lateral cephalogram [Figure 5] image will be taken. Total treatment time will be calculated from the time of placement of the appliance to the removal of the appliance, dentoalveolar and soft-tissue changes were calculated by pre- and post-appliance lateral cephalogram images, and the CON-GF relationship and skeletal changes if any will be calculated by pre- and post-appliance CT Images [Figure 4] and pre and post treatment photographs [Figure 6]. 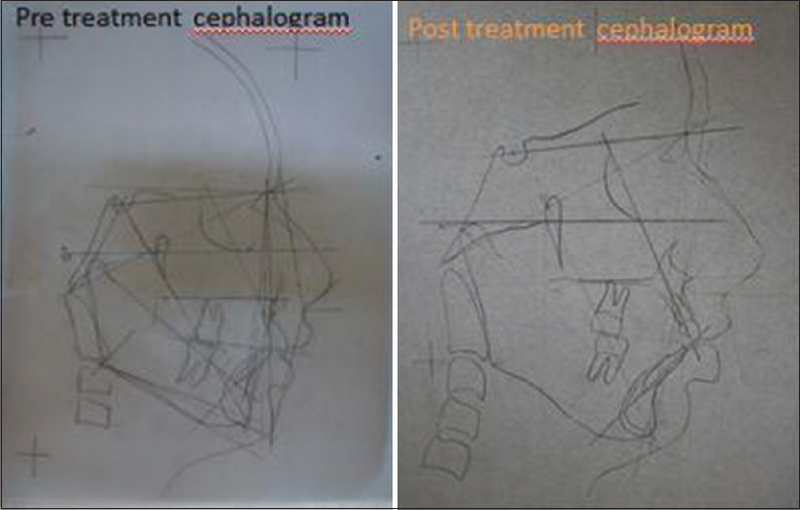 The comparison of pre- and post-treatment variables of lateral cephalogram images was recorded [Figure 7]. 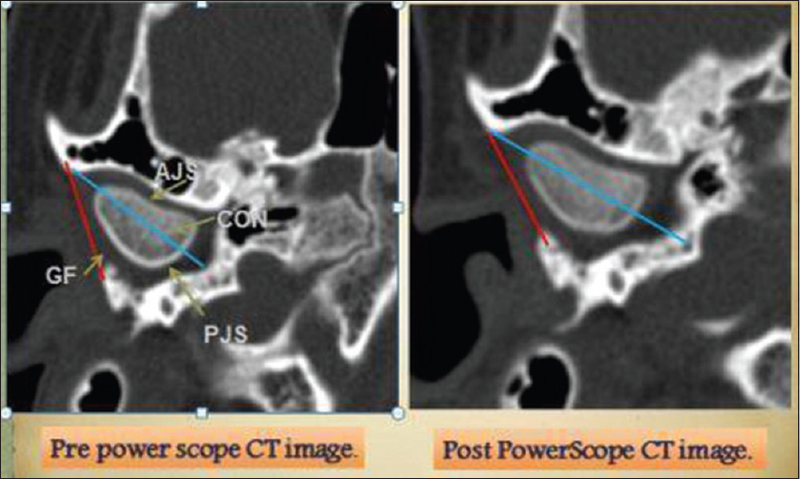 Of the CT images, three consecutive selected slides of TMJ were separated and analyzed, where anterior and posterior joint space and position of the CON of pre- and post-treatment CT images were calculated and recorded. Descriptive statistical analysis will be performed using Wilcoxon signed-ranks test to compare before and after treatment results. Calculated values were subjected to statistical analysis and the results obtained were Tabulated as [Table 1], [Table 2], [Table 3], [Table 4], [Table 5], [Table 6] and also graphical representation was done as [Graph 1],[Graph 2],[Graph 3],[Graph 4],[Graph 5],[Graph 6]. Various orthodontic techniques and appliances have been introduced to treat Class II malocclusions, including intraarch and interarch appliances, extra-oral appliances, and surgical repositioning of the jaws. Intermaxillary elastics are a typical interarch method used for Class II correction. However, intermaxillary elastics rely heavily on patient compliance for their effectiveness, and compliance in orthodontics is variable and difficult to predict. Poor cooperation can lead to poor treatment results and increased treatment time. A number of compliance-free interarch appliances have been developed. Fixed interarch appliances typically demonstrate the mesial movement of the mandibular molars, tipping of the mandibular incisors, and variable effects associated with mandibular growth. 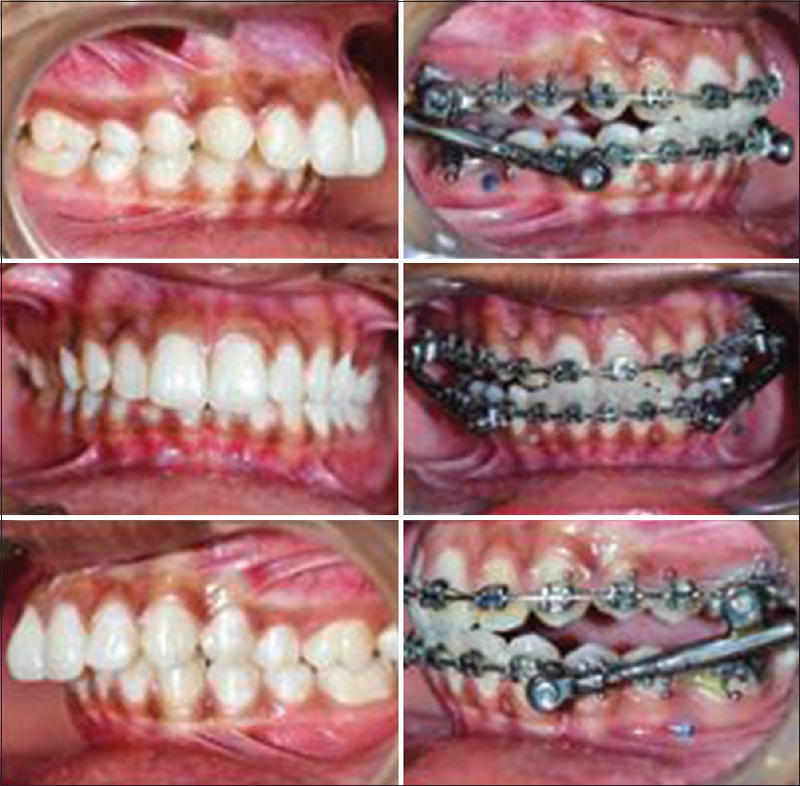 Efficiency of treatment mechanics of FFAs in noncompliance patients has been a major focus throughout the history of these appliances in orthodontics. Flexible – Churro jumper, Jasper jumper, etc. 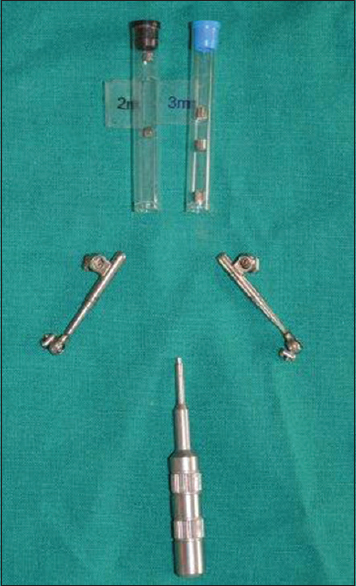 Hybrid – Forsus, PowerScope, etc. Asymmetric cases - midline correction. In this study, the pretreatment SNA, A to NP, and MAX L values are 82.00 ± 1.33, 0.20 ± 0.42, and 93.60 ± 4.00; after PowerScope use, posttreatment SNA, A to NP, and MAX L are 82.1 ± 0.87, 0.40 ± 0.69, and 94.20 ± 2.82, respectively. All these values subjected to Wilcoxon signed-rank test showed a P = 0.792, 0.480, and 0417, which indicate that they were not significant. Hence, there is no change in maxillary base with PowerScope appliance. As a cephalometric study  of Class II division 1 with FFA also showed no change in maxillary base, this study results correlate with the present study. 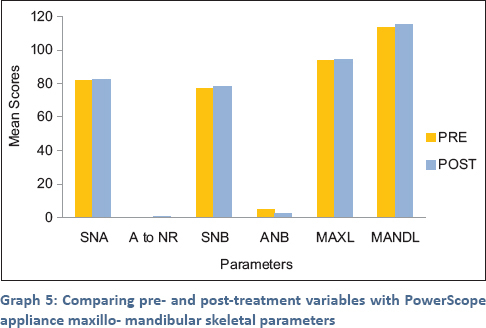 In this study, the pretreatment SNB, Mand L, and skeletal facial convexity (SFCVX) value are 77.00 ± 2.21, 113.40 ± 3.62, and 13.50 ± 1.43, and after PowerScope use, posttreatment SNB, Mand L, and SFCVX are 78.50 ± 3.24, 115.00 ± 2.44, and 12.00 ± 2.58. All these values subjected to Wilcoxon signed-rank test showed a P = 0.072, 0.100, and 0.081, which indicate that they were not significant. Hence, there is no change in mandibular base with PowerScope appliance and there is change in mandibular length which was not significant. A study , with other FFA showed that there is no change in mandibular base and is change in mandibular length which was not significant; these study results correlate with the present study. Relationship of maxilla to mandible was investigated by evaluating ANB, wits, and beta angle. In this study, the pretreatment ANB, wits, and beta value are 5.00 ± 1.70, 10.00 ± 1.82, and 25.14 ± 3.67, respectively, and after PowerScope use, posttreatment ANB, wits, and beta are 2.60 ± 2.17, 5.50 ± 0.97, and 28.00 ± 5.50, respectively. All these values subjected to Wilcoxon signed-rank test showed a P = 0.004, 0.005, and 0.045, respectively, which indicate that they were significant, except beta angle which is nonsignificant. 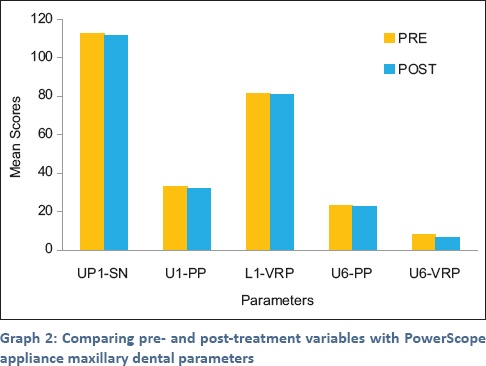 Hence, there is significant change in maxillo-mandibular relationship with PowerScope appliance. A study  shows a significant change in maxillo-mandibular relationship with other FFA; hence, these study results correlate with the present study. In this study, the pretreatment upper 6 to PP value is 33.20 ± 1.87, and after PowerScope use, posttreatment upper 6 to PP is 32.00 ± 0.81. Both these values subjected to Wilcoxon signed-rank test showed a P = 0.057, which indicate they were not statistically significant. Hence, there is no significant change in maxillary height in relationship with the PowerScope appliance. In this research, we had decrease in upper 6 to PP, which accounted for intrusion of maxillary molars during the treatment by FFA. There was clockwise rotation of occlusal plane, and this justified the high values of wits. This can be supported by the study by Jacobson, who stated that the high reading of the wits value is due to the changing occlusal plane angle. No significant change in maxillary height was reported in a study by Jasper et al. ; no significant change in maxillary height was reported in a study by Pancherz and Anehus-Pancherz  using an FFA. In a study by Heinig and Göz  using FFA in the correction of Class II, no significant change in maxillary height was seen. Hence, all these studies correlate with the present study. In this study, the pretreatment L1-to-NB and L1-to-MP are 1.20 ± 0.42 and 92.80 ± 3.22, respectively, and L6-to-MP and L6-to-VRP are 33.10 ± 2.47and 45.20 ± 2.09, respectively; after PowerScope use, posttreatment L1-to-NB and L1-to-MP are 2.20 ± 0.63 and 99.08 ± 5.39, respectively, and L6-to-MP and L6-to-VRP are 33.10 ± 1.19 and 43.30 ± 1.63, respectively. Both these values subjected to Wilcoxon signed-rank test showed a P = 0.004 and 0.005, respectively, and 0.916 and 0.138, respectively, which indicate significant. Hence, there is a significant change in mandibular relationship with lower incisor PowerScope appliance L6-to-MP increased that indicated compensation for 6 to palatal plane and clockwise rotation of occlusal plane. In this study, the pretreatment anterior facial height (AFH) and posterior facial height (PFH) are 125.80 ± 2.82 and 81.40 ± 1.07, respectively, and after PowerScope use, posttreatment AFH and PFH are 125.30 ± 1.25 and 82.20 ± 0.42, respectively. Both these values subjected to Wilcoxon signed-rank test showed P = 0.431 and 0.033, respectively, which indicate not significant AFH (as P>0.05) and significant PFH (as P<0.05). Hence, there is a significant change in vertical relationship with PowerScope appliance. 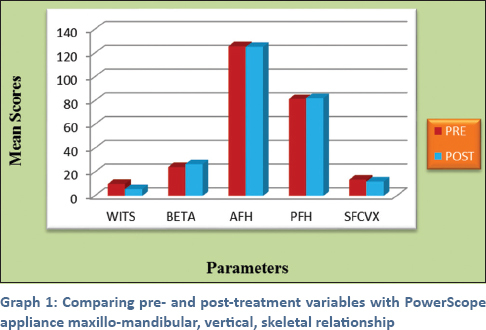 In a cephalometric study  for the Class II correction by FFA, significant change in vertical relationship that is PFH was reported. Hence, these results correlate with the present study. In this study, the pretreatment overjet and overbite and INTINCSA are 8.10 ± 0.87, 4.20 ± 1.39 and 119.70 ± 4.20, respectively, and after PowerScope use, posttreatment overjet and overbite and INTINCSA are 3.60 ± 1.07, 2.20 ± 0.42, and 122.60 ± 3.47, respectively. Both these values subjected to Wilcoxon signed-rank test showed P = 0.005, 0.011, and 0.074, respectively, which indicate significant Overjet and Overbite, not significant interincisal angle. Hence, there is a significant change in interdental relationship with PowerScope appliance. Previous studies ,, showed that overjet and overbite had significant change in interdental relationship in Class II noncompliance patients. In this study, the pretreatment upper lip to E-plane value is 0.05 ± 3.22, and after PowerScope use, posttreatment upper lip to E-plane is 0.65 ± 5.39. Both these values subjected to Wilcoxon signed-rank test showed a P = 0.053 which indicate that they were not significant. Hence, there is no significant change in soft-tissue relationship with the PowerScope appliance. 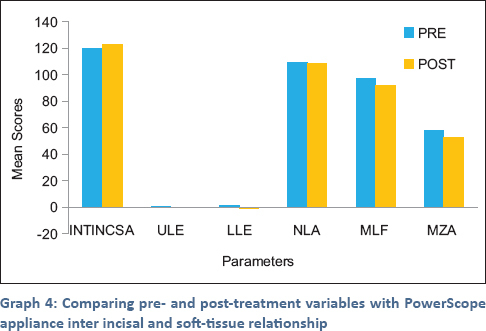 Similar results were reported  in a study of soft-tissue profile following FFA therapy, resulting significant improvement in facial profile; hence, these results do not correlate with the present study. In the literature, the CON-GF relationship of the TMJ has been assessed by measuring the distance between two reference points through lateral cranial radiography, linear tomography, parasagittal magnetic resonance imaging, and transverse CT (1 slice) techniques. The TMJ has a three-dimensional structure; however, superior, anterior, and posterior joint distances do not have the same volume. The measured distance from one point to another might not always represent the actual relationship between the two anatomic structures in three dimensions. In this study, the pretreatment GF and CON are 628.30 ± 43.96 and 318.60 ± 23.68, respectively, and after PowerScope use, posttreatment GF and CON are 682.20 ± 58.17 and 347.70 ± 33.19, respectively. Both these values subjected to Wilcoxon signed-rank test showed P value of 0.074 and 0.074, respectively, which indicate that they were not significant. Hence, there is no significant change in CON and GF changes with PowerScope appliance. A study  reported two patients with Class II division 1 malocclusion treated with the FFA during a 2-year follow-up period. They observed no significant change in CON and GF changes; hence, this study does not correlate with the present study. In a prospective clinical study, 100 patients with Class II division 1 malocclusion were treated with the FFA. Using orthopantomographic and CT images taken 3 months after treatment initiation, they discovered paired contours as a result of new bone formation in the fossa articularis (GF) and posterior portion of the CON but did not identify any changes in the control group. Hence, this study does not correlate with the present study as our sample was less and also some race difference when compared the study. In this study, the pretreatment anterior joint space (AJS), posterior joint space (PJS), and AJS-PJS are 189.40 ± 23.33, 150.50 ± 17.94, and 38.90 ± 30.82, respectively, and after PowerScope use, posttreatment AJS, PJS, and AJS-PJS are 241 ± 43.97, 131.60 ± 19.52, and 109.40 ± 36.04, respectively. All these values subjected to Wilcoxon signed-rank test showed P = 0.017, 0.016, and 0.007, respectively, which indicate that they were statistically significant. Hence, there is significant change in joint relationship with PowerScope appliance. A study  revealed two patients with Class II division 1 malocclusion treated with the FFA during a 2-year follow-up period. They observed significant change in joint relationship; hence, it correlates with the present study. A significant change in values in relation to anterior and posterior joint spaces with PowerScope appliance. Hence, PowerScope device brings about the correction of Class II malocclusion in young adults and late adolescents partly by skeletal movement and mostly by dentoalveolar movement with a significant improvement in facial profile. Further high-quality randomized controlled trials with proper inclusion criteria for Class II malocclusions are needed to fully elucidate the efficiency of PowerScope in treatment within young adults and late adolescents. Graber TM. Current Principles and Techniques. 4th ed. Elsevier; 2005. Khumanthem S, Kumar M, Ansari A, Jain A. Correction of Class II using Powerscope Appliance – A Case Report. Arch of Dent and Med Res 2016;2:120-5. Pancherz H, Anehus-Pancherz M. The headgear effect of the Herbst appliance: A cephalometric long-term study. Am J Orthod Dentofacial Orthop 1993;103:510-20. Jasper JJ, McNamara JA, Arbor A. The correction of interarch malocclusions using a fixed force module. Am J Orthod 1995;108:641-50. Ruf S, Pancherz H. The mechanism of class II correction during Herbst therapy in relation to the vertical jaw base relationship: A cephalometric roentgenographic study. Am J Orthod 2002;121:31-7. Jones G, Buschang PH, Kim KB, Oliver DR. Class II non-extraction patients treated with the forsus fatigue resistant device versus intermaxillary elastics. Angle Orthod 2008;78:332-8. Heinig N, Göz G. Clinical application and effects of the Forsus ™ spring. A study of a new Herbst hybrid. J Orofac Orthop 2001;62:436-50. Covell DA Jr., Trammell DW, Boero RP, West R. A cephalometric study of class II division 1 malocclusions treated with the Jasper Jumper appliance. Angle Orthod 1999;69:311-20. Ruf S, Pancherz H. Temporomandibular joint remodeling in adolescents and young adults during Herbst treatment: A prospective longitudinal magnetic resonance imaging and cephalometric radiographic investigation. Am J Orthod Dentofacial Orthop 1999;115:607-18. Quintão C, Helena I, Brunharo VP, Menezes RC, Almeida MA. Soft tissue facial profile changes following functional appliance therapy. Eur J Orthod 2006;28:35-41. Stromeyer EL, Caruso JM, DeVincenzo JP. A cephalometric study of the class II correction effects of the Eureka Spring. Angle Orthod 2002;72:203-10. Paulsen HU, Karle A. 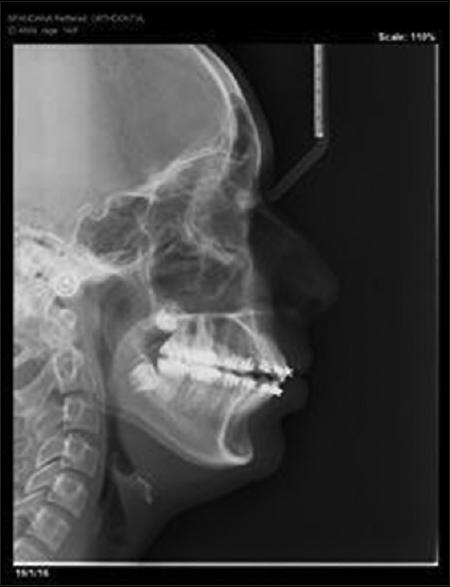 Computer tomographic and radiographic changes in the temporomandibular joints of two young adults with occlusal asymmetry, treated with the Herbst appliance. Eur J Orthod 2000;22:649-56. Paulsen HU, Karle A, Bakke M, Herskind A. CT-scanning and radiographic analysis of temporomandibular joints and cephalometric analysis in a case of Herbst treatment in late puberty. Eur J Orthod 1995;17:165-75.